It’s winter, even here in Los Angeles and sometimes I want a dish that wraps its arms around me and gives me a huge hug. That’s when I turn to collard greens. Yet my craving didn’t stop at comfort, I wanted the heat of spice and a bit of crunch. I also wanted to keep the bright green of fresh collard greens. I was determined to stop my collards from marching into the drab army green of so many other recipes. I am happy to say, success! This is an extremely simple, spicy and green recipe. Zing from ginger, crunch from corn, coconut milk provides a bit of sweetness and the collard greens retain their wonderful color while wrapped in this flavorful embrace. 1 ear of corn kernels removed. Frozen corn can be used. Clean and coarsely chop ginger, garlic, shallot and put into food processor. Pulse until a paste is made. Heat a large saute pan add a splash of olive oil. Then add paste. Cook for about 3-5 minutes stirring. Lower heat if garlic begins to brown. Add collard greens. Toss and cook for about 2 minutes until the leaves are coated with coconut milk. Remove from heat, cover and let steam for about 5 minutes. Disclosure: Cut ‘N Clean Greens sent the collard greens for recipe development. Wow is THAT interesting! 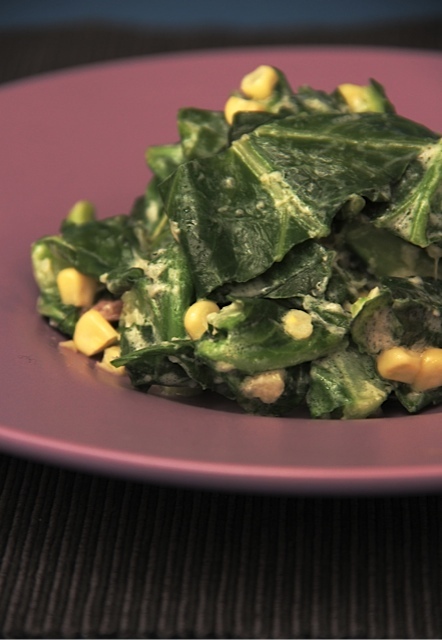 Coconut milk and corn on collards…I must try it!